Everyone have their own parameters of why and how they feel honored. I was lucky enough to experience many of them in a sequence. Few days before, I received a call from an unknown number. The guy said that I am invited for a felicitation event in my engineering college. These words itself were a dose of appreciation to my efforts. Today i.e. on March 13, 2014 I went to my college where I saw all students celebrating their cultural event with great zeal. Immediately, the sequence of frames in my mind went on a rewind mode to those memories where I used to be a part of it with fervid fervor. 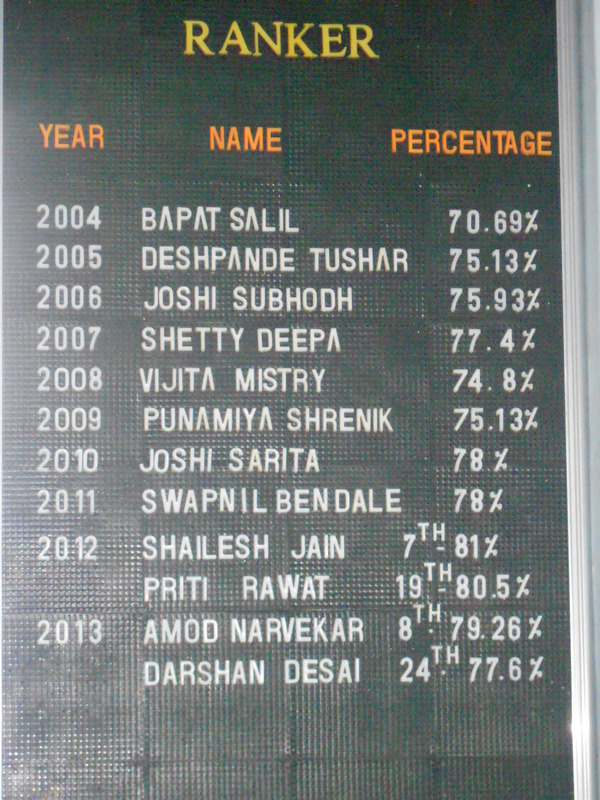 Names of toppers with their university rank and percentage. I went inside the college. It seemed to be much amiable and soon I found myself very much ambient rather than being formal. I met many of my ranker friends and my juniors and spent some time talking with them. This reminded me how quickly the 4 years passed away transforming me from a fun loving boy to professional serious man. Then was the prize distribution event. My name was announced along with my percentage and University rank. When I was pursuing my graduation course, I always wished to be among the top ten university rankers. This happiness of getting my wish fulfilled made me feel honored. Touching the feet of H.O.D. and receiving blessings from her is ineffable. Then I met all my teachers who were equally happy to see me. This affinity made me feel honored. And finally, my name is added to the list of toppers of the department which, again, was my dream during my graduation era. I would like to thank all my enthusiastic friends, seniors and juniors and even foes from whom I got to learn many lessons of life. A salute to my parents who gave me life and by educating me, gave an art of living. Day 1 of summit started with a great hurry. I woke up at 6.20 am and realized that there was a morning walk round Silicon Valley organized which was sharp at 6.30. I immediately messaged Vineel whether it was held. I thought since everyone was super-tired after 18 hours journey, the walk would be postponed. But unfortunately, all Mozillians are usually sleep-deprived 😛 :P. The walk took place as scheduled and all left at sharp 6.30 leaving us behind. We tried to find them but in vain. Then there was breakfast. We saw a table with only 3 people and choose to sit with them. And who knows I would meet some of the brilliant minds of Mozilla. Yash shah, Jignesh Kakadiya and the great optimizer (Girish Sharma). Talking with them was a superb experience. Breakfast included Omlets, fruits and chicken stuffs (Imagine all were boiled). Later I had a similar-to-Falooda-like-stuff having strawberries, raspberries, grapes, etc. We realized that it was very late and we rushed to our room. After a bath we reached California Ballroom. 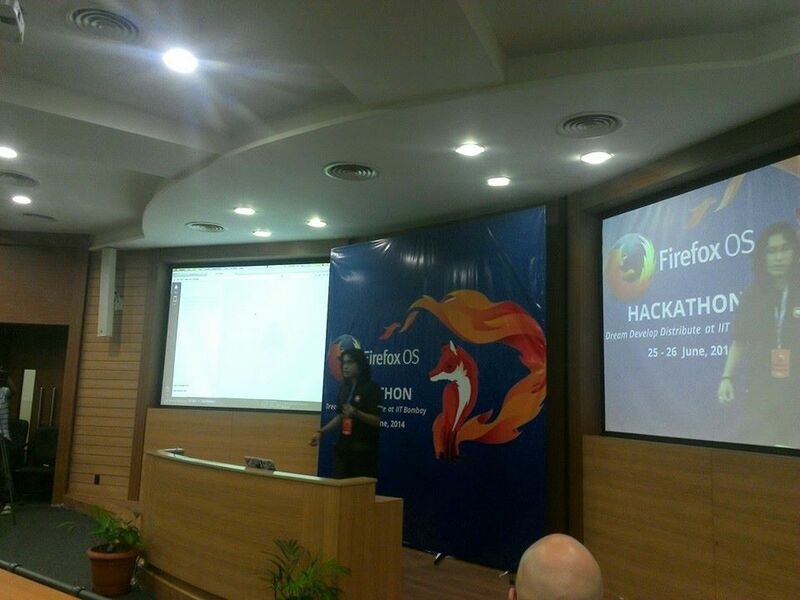 The session had already begun, was given by Branden Eich, the CTO of Mozilla. The session was about Webmaker and Geolocation through Web. Then was the world fair. I dressed-up in traditional and took our chivada to the Mozilla India showcase. Priyanka, Sara and Diwanshi arranged the contents very beautifully. 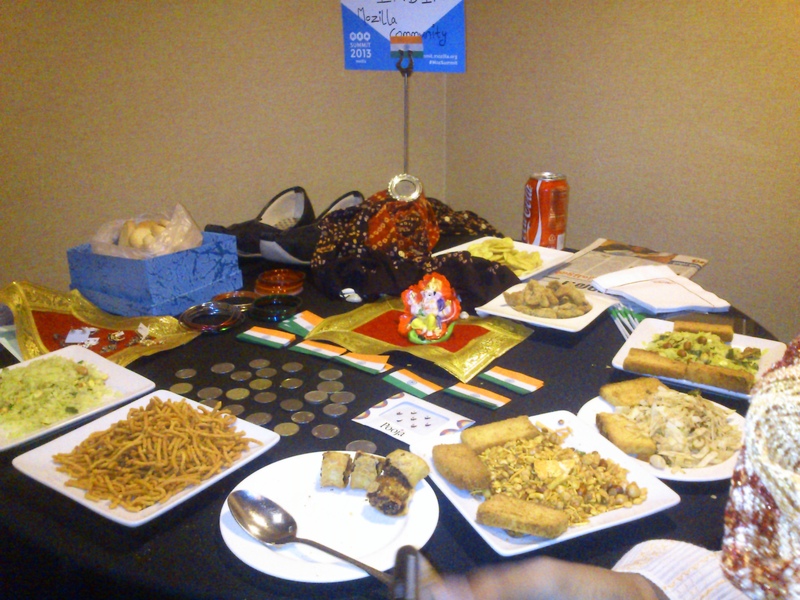 As the session started, all the foreigners visited and tasted some of the food items. It was the best experience I could ever get. Interacting with foreigners was simply awesome. I just loved it.  Then we picked up the lunch bag and proceeded to attend next session. Here comes Christian Heilmann and Sandip Kamat into picture. Discussion on FFOS was on its peak. The good part of it was that it facilitated interaction with students. Kaustubh, Soumya, RyanV were volunteers and contributed in making the session a super-hit. 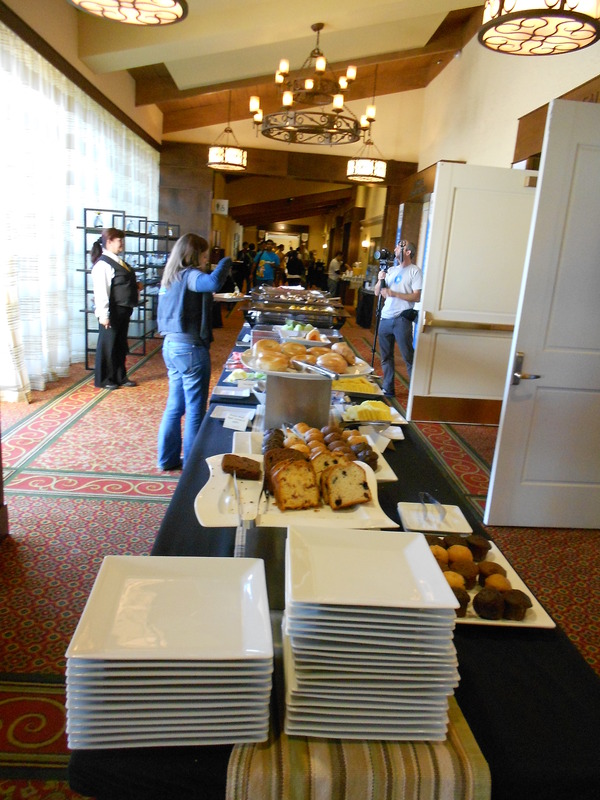 We had our lunch…Pastas, salad were boring but desert and fruits were awesome. It was the first of its kind I ate sunh a lovely apple. My legs were super paining and we were literally drooping. So we decided to skip the session and have a sleep for a while. That “while” turned super-while and we woke at 5.30. So we missed the Branden Eich session as well as group photo  Then was Moz Reps meeting. That included introduction and expressing one lovable and unlovable feature which we feel so. Many mentioned Budget request and monthly reports as disliking one. I mentioned Welcome swags as great but a blank black tshirt as disappointing feature. Then was the FFOS grand party. We met Ankit Bahuguna, Shahid and Shawn outside. After having few friendly talks we approached the Party. The tables were beautifully arranged giving us a very “Royal” Feeling. The dinner was awesome. Salads as starters, main course included Tuscani chicken and fish and wonderful cake for dessert. Thus was the end of day 1. Mozilla Summit was one of the most memorable events I attended. It was my first international travel and that too in Silicon Valley. The exuberance started in Dubai itself when I started meeting all Mozillians with whom I had interacted through IRC or Facebook. In my flight as well, I had Sai Kiran, Hema Bhanu, Meeraj Imran, Maniraj and many more around me.. So the fifteen hours went awesome. Also the tasty food on UAE Emitrates added to the splendour. Finally we reached San Francisco and after the immigration interview, we reached the arrival section of airport. 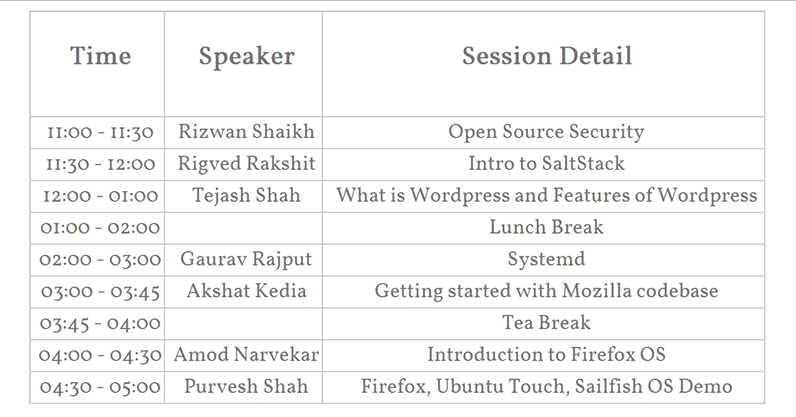 Mozilla Volunteers were already present to receive us. We reached Santa Clara Marriot Hotel through a shuttle arranged by Mozilla. On the way we saw something which I never thought I would ever see even in my happiest dreams. We saw offices of MICROSOFT, ORACLE, BROADCOM, EVERGREEN NOTE, MOTOROLA, MCAFEE…(heavenly feeling). Also I saw the 4-star royal hotel rooms for the first time. That made me feel very special. We were presented awesome Mozilla Welcome package. After a bath, we went to Grand Ballroom for dinner.